The last thing you want after putting all your time and money into a kitchen remodel is to find out that your efforts didn’t do much to curb your clutter habits. The dish soap and sponges appear once again next to the sink. The toaster gets used and never put away. Unopened wine bottles accumulate on the counter. To prevent those kinds of scenarios, think strategically about your storage, no matter which room you’re remodeling, and put relatively affordable innovations such as drawer inserts and rollouts to good use. 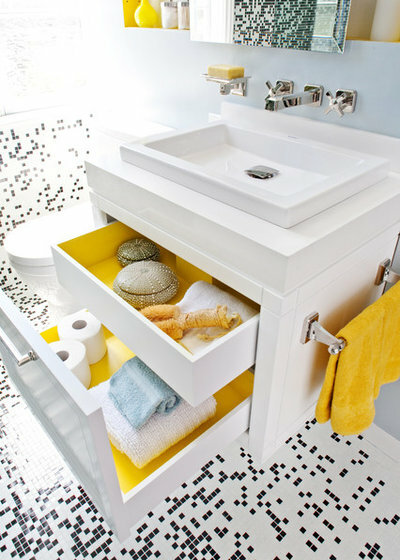 Here are a few of my favorite storage solutions for kitchens, bathrooms and utility rooms. Inserts. 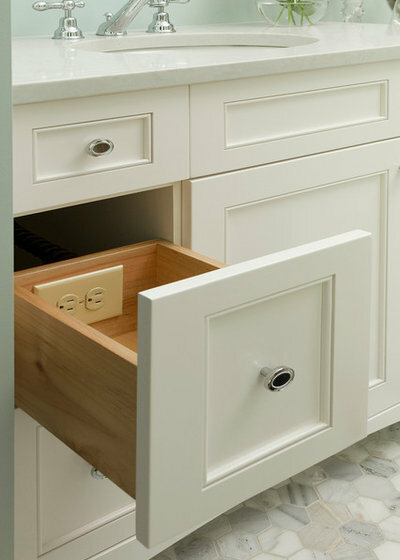 Cabinet inserts and accessories are a common request I see in kitchen remodels. There are in-drawer inserts, such as knife blocks and spice holders, that can be made (or cut down) to custom sizes to fit in any drawer. There are also rollout inserts, as shown here, which are typically installed in lower cabinets, and roll out to hold a variety of items, such as utensils, pots and pans, and cutting boards. Don’t have a wine room? No space in the fridge? 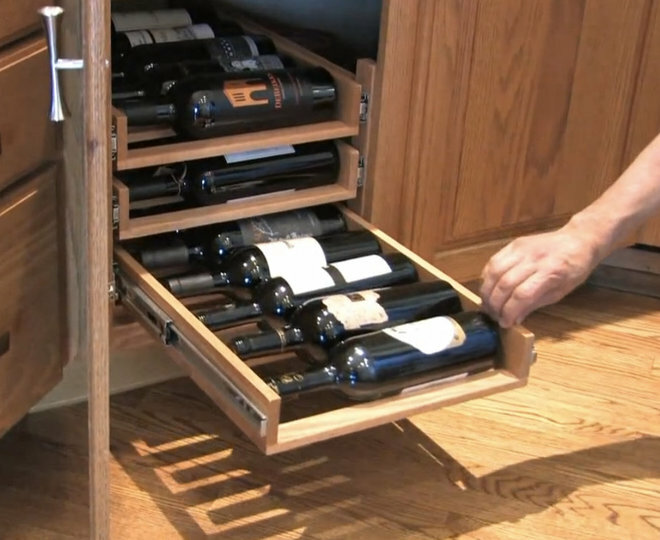 There are dedicated rollout inserts for storing wine in base cabinets too. Appliance garages. Also sometimes called appliance closets, these are cabinets designed around size requirements for mixers, blenders, toasters and pretty much any other small appliance you may have and want to store. They put those appliances within easy reach when you need them and help tuck away and hide them when you don’t, keeping your countertops free of clutter. Appliance garages also can be equipped with outlets, mixer lifts and rollout platforms that allow you to use an appliance without having to unplug it and move it. Drawer inside the trash drawer. 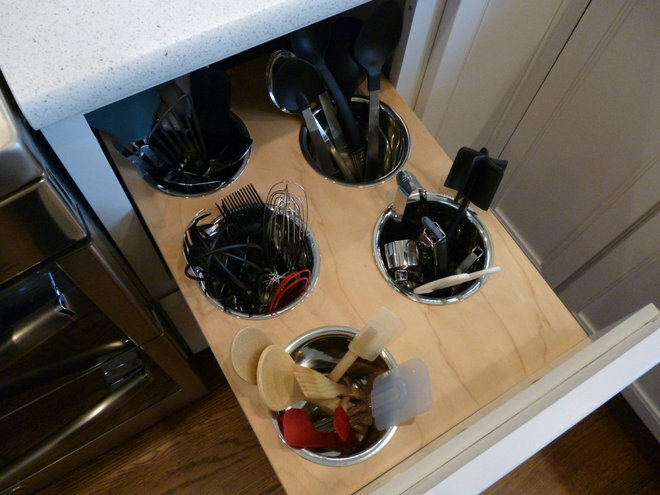 Trash drawers are a well-known solution for organization within the kitchen. 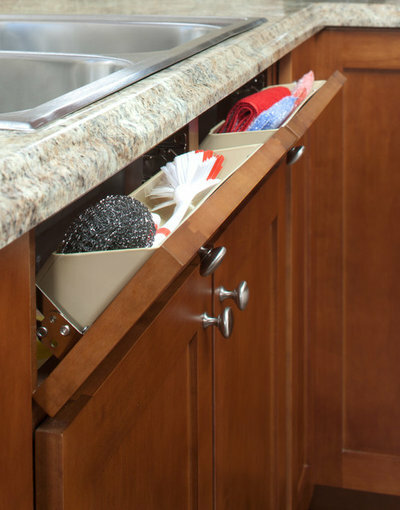 However, adding a drawer inside the trash drawer (where there is usually wasted space above the cans) is an inventive, hidden way to store things such as trash bags, oven mitts and hand towels. Tall, skinny drawers. Be creative with otherwise impractical spaces. Tall, skinny drawers have become increasingly popular for their demonstrated utility. 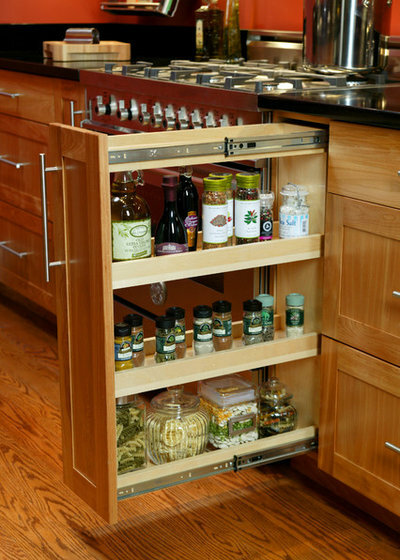 Install one on each side of your cooktop to store spices and oils. Or place one next to the sink for dish soaps and other cleaning supplies. Undersink storage. Another storage opportunity is the typically unusable area directly under the sink. Instead of putting a false panel on the front, consider installing a tip-out tray where brushes and sponges can be placed when not in use. Medicine cabinets. These have come a long way since they were first introduced. Big, chunky wooden pieces that stick out from the wall have been replaced by recessed boxes with mirrors that can smoothly slide open to reveal shelves, lighting, magnifying mirrors and even TVs. Electrical plugs installed inside the cabinets. These are great for using hair dryers and straighteners while making sure they stay off the counter when they’re not in use. Some companies make drawers and cabinet inserts specifically for this purpose. Niches. These are an absolute must for me when designing a shower, shower/tub combo or even just a tub. Niches can be big or small, visible or hidden, one level or two. As a product hoarder, my ideal niche is about 30 inches wide, 18 inches tall and, if possible, placed on a wall that makes it invisible when you enter the room. Rollouts. Rollouts are more commonly seen in the kitchen, but they can be just as useful in your bathroom. Installing a couple into a full-height cabinet can make for easy storage and allow quick access to face creams, hair products, hand towels and other daily necessities. Another great place for a rollout is in the cabinet underneath the sink, as shown here. Often, plumbing gets in the way of seeing (and using) all the space in this area. A rollout helps eliminate this problem, making much of the space below easily accessible. Valet rods. A valet rod is an awesome little piece of hardware that I personally believe is underrated. It can be installed on a wall or the outside of a cabinet and extended when you need to hang something, then put away when you’re all done. Connie Young Design, a division of ce de ce inc.
Ironing board drawer insert. Bear with me, because I’ve got to harp on my love of drawer inserts one more time. 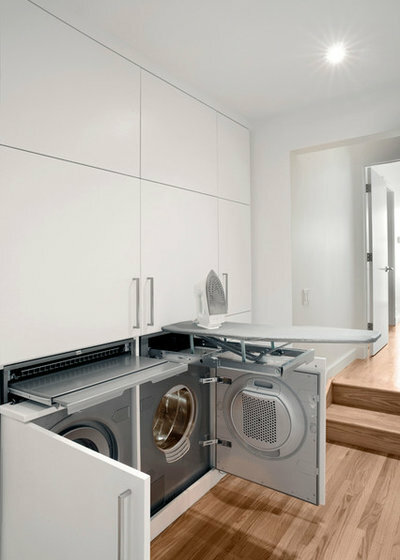 There are drawer inserts that open to reveal a foldable ironing board, as shown here. Yes, a standard wall cabinet is another storage option, but if you’re a clean freak like me, a more covert solution like this one is too good to pass up. Toe-kick storage. This is a perfect place to store things such as pet food and water bowls. Close to the ground but easily out of sight, toe-kick storage is ideal for you and for your furry friend. Another common item I see kept in toe-kicks are small step ladders. These nifty additions are great for kitchens too. Of course, this is not an all-inclusive list. Don’t feel dismayed if these solutions don’t work with your remodel. Rather, take inspiration from what’s already out there and create something brand new that suits your exact needs. After all, no one knows what you need and want better than yourself.